Johannesburg, Randburg, Blackheath and Sandton. We can cover the magisterial districts of Johannesburg, Roodepoort, Randburg & Germiston. Our firm has five service points, set out here above. This distinguishes us from many other firms and has the result that we can serve clients in the magistrate's court districts of Randburg, Johannesburg, and Roodepoort and Johannesburg High Court without using a correspondent in any way whatsoever. This fact makes us more accessible to clients as well as other parties for purposes of having consultations at an address which will be convenient for a client or other party. We have a long and established client base involving corporate entities, small and medium enterprises and well-established individuals. Our firm has available for its clients the experience and expertise of legal practitioners in regard to almost a full spectrum of the law. We are also in the fortunate position that we have access to the experience of a large international firm in New York, USA. 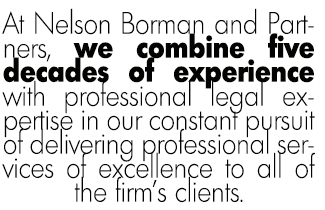 The practice gradually developed and eventually became an incorporated practice known as Borman, Snyman & Barnard Inc. In 1985 the Potgietersrus firm decided to expand and, more specifically, towards the south of Potgietersrus. A branch office was pursuant to the a foregoing established in Johannesburg in August 1985. The two practices separated in 1989, leading to the establishment of Nelson Borman & Partners Inc.
Nelson Borman and Elmarie Borman.